Service to the community is the fundamental purpose of the Grange and the Granges in our State and carrying out many projects which benefit their communities. We received reports from Subordinate Granges who are continuing the Dictionary Project, supporting local food banks and shelters, blood drives, walk-a-thons and help to homeless veterans. New projects reported were giving gardening advice, cleaning grave markers, donating seed potatoes to a local voyage high school, adopting a family at Christmas, donating to a local pet shelter and sending care packages to soldiers overseas in harms’ way. We also received an excellent report from Ekonk Community Junior Grange. Many Granges are trying to include other community groups to work with. We suggest contacting your local high school guidance office, as most schools require high school students to complete specific amounts of community service hours prior to graduation. Our Granges reported a very impressive 78,663 hours of community service for 2012, which is an increase of 4,556 hours over last year. An almost equal number of Grange members/non-Grange members were included in this work. that’s a lot of potential new members to recruit. This year we again divided the entries into two categories- Granges with membership of 50 and under and this with 51 and above. The winners on the State level for 50 and under were: 1- Prospect #144; 2- Stonington #168; 3- Old Lyme #162. 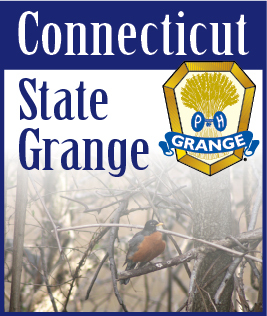 Granges with membership of 51 and over were: 1- Ekonk Community #89; 2- Cheshire #23 and 3- Lyme #147. Of all the reports we received, the judges chose that of Ekonk Community Grange to be the very best. They were awarded Best of Show and their report was sent to National Grange for competition on the National level. We understand that the judges out in Boise, Idaho deliberated for two and a half days before making a final decision. We are very pleased to report that Ekonk Community Grange placed first in the country for their community service work! Their projects included relief efforts after Hurricane Irene struck, serving food at the Relay for Life fundraiser, providing remembrance flags for fallen heroes and completing their Home for Veterans project. They also excel at keeping the public informed as they do these things. Congratulations to Ekonk Community Grange on their award and to all our Granges for their good works.